Britt's Broadcast: Can you believe this kid? Can you believe this kid? David Archuleta is AMAZING! If he does not win American Idol it will be a travesty. I thought this kid was amazing before I even knew he was from my hometown of Murray, UT! I have to admit that I liked him even better after I found that out, but I still wasn't convinced until I heard his most recent song on American Idol, "Imagine." You can check it out on my playlist if you haven't heard it. Also, I have to admit that we bought the song on Itunes. It's just that good! He makes me smile when I watch him. He is so humble and so sincere. When he is not singing he is so awkward, but charming at the same time. I love that he is so innocent, which is why I almost don't want him to do well. I hope that Hollywood won't taint his sweet spirit. 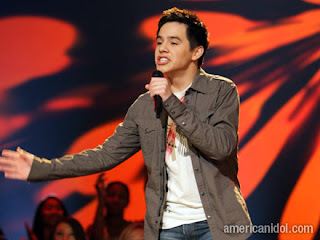 If you haven't tuned into American Idol this season, David Archuleta is definitely a great reason watch! Wow, BRIT you must have too much time on your hands! But, I agree he's good! I called and voted for him! He is my FAVORITE this season!! Yeah, it helps that he's from Utah, but he really has an amazing voice ... Camille told me how incredible his performance was this week (Imagine) and as soon as we got around to watching it last night (on TIVO), I had to call her immediately to talk about it! What a cute kid with a fabulous voice! I hope he wins!!! I agree! He's our favorite too! Thanks for the recipes! He is really amazing...can't beleive his stage presence for a 17 year old! WOW! Sure to be sucessful even if AI doesn't do him justice. His aunt (the lady you always see in the audience) is my aunts best friend. His dad grew up in my dad's ward. I have been getting updates on him for months. He goes to church every sunday and still thinks he is going a mission. I was skeptical of all the hype (like my grandma really knows who is good) but it turns out I really do like him. I was speechless after he sang "Imagine," and for me to be speechless is a rarity. WOW! Britt...you are my new favorite mommy "IDOL" I mean..how do you get it all done? I love all of your posts! (especially the one about the rugs, because I TOTALLY throw mine in the dryer too :) in fact..I really love what they look like before people step on them, and I will try to avoid stepping on them if at all possible...ha ha ha) Your treat basket idea is GENIUS! I was thinking that you could name your card jar "EYE CANDY" something that is sweet to read??? too corny?? And last but now least, I LOVE David. He is by far my fav, and I look forward to listening to him sing every week. (I record it, and listen to him like 5 times!!) I hope he wins, but would hate for such a GOOD WHOLESOME kid to be destroyed by "Hollywood" oh yeah...thanks for the recipes too!